The makers of The Babadook have struck gold again, with Jennifer Kent’s much anticipated second feature film The Nightingale set to have its World Premiere in competition at the 75th Venice International Film Festival (29 August to 8 September 2018). The film was jointly produced by Kristina Ceyton of Causeway Films and Bruna Papandrea and Steve Hutensky of Made Up Stories. The feature is joined by two virtual reality (VR) short films also in competition – Michael Beets’ The Unknown Patient (World Premiere) and Lynette Wallworth’s Awavena (International Premiere). The two VR inclusions both provide the audience with immersive story experiences, with The Unknown Patient retracing the true story of an Australian soldier found wandering in London with no memory of his identity. 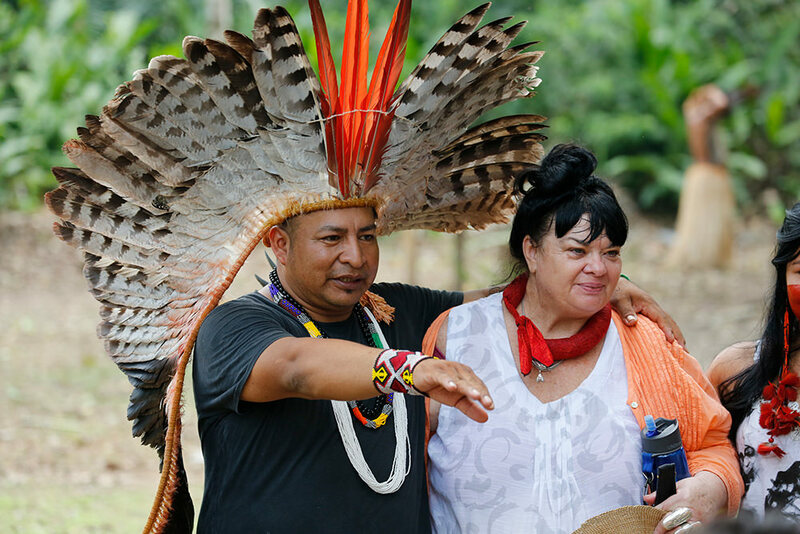 Conversely the Australian-US team behind the Awavena have told a world story, centered on allowing the viewer access to the spirit realm as seen by an elder of the Indigenous Amazonian people. Notably Australia’s selection for Venice includes two female directors, plus Awavena has an all-female producing team. Australian films have proven popular at the Venice International Film Festival in the past, with Warwick Thornton’s Sweet Country receiving a rapturous reception last year and taking home the Special Jury Prize. Hacksaw Ridge, Boys in the Trees, Tanna and Hounds of Love are also recent Venice alumni. The Venice announcements come in the same week that it was revealed Australian feature film Hotel Mumbai will have its World Premiere at the Toronto International Film Festival in September followed by an Australian Premiere at the Adelaide Film Festival in October. Synopsis: Set in 1825, Clare, a young Irish convict woman (Aisling Franciosi), chases a British officer (Sam Claflin) through the rugged Tasmanian wilderness, bent on revenge for a terrible act of violence he committed against her family. On the way she enlists the services of an Aboriginal tracker named Billy (Baykali Ganambarr), who is also marked by trauma from his own violence-filled past. Production Credit: The Nightingale is a Causeway Films and Made Up Stories production. Principal production investment from Screen Australia in association with Bron Creative. Financed with support from Screen Tasmania and South Australian Film Corporation. Synopsis: In 1916 a man was found wandering the streets of London in an Australian soldier’s uniform. He did not know who he was. He was deemed unfit for service, labelled a ‘deserter’, and sent to Sydney’s Callan Park Mental Asylum where he would spend 12 years without an identity: lost and forgotten. How he came to be found is the remarkable true story of ‘The Unknown Patient’. In real-time interactive virtual reality, through discovery and exploration of the patient’s memories and real-life events, the audience is invited to piece together the identity of the Unknown Patient. In doing so, the audience experiences the impact that war had on the psyche of soldiers who made it home and the hope that this story gave to a nation in mourning. Production Credit: The Unknown Patient is a Unwritten Endings and VRTOV production. Principal production investment from Screen Australia. Synopsis: For the Yawanawa, an Indigenous Amazonian people, every living thing has a spirit. Using technology that the Yawanawa feel enables them to share their visions, this immersive work allows the visitor to enter the spirit world seen by their elder shaman Tata, and his disciple Hushahu – the Yawanawa’s first female shaman whose transcendent visions helped to revive a culture. Production credit: Awavena is a VR Wallworth/Coco Films production, Presented by Technicolor Experience Center and Screen Australia in association with Just Films, Ford Foundation, Madison Wells Media and Create NSW. Supported by Stories of Change, a project of the Sundance Institute supported by the Skoll Foundation, Sundance Institute New Frontier Artist Residency Program, The World Economic Forum, Sundance Institute Documentary Film Program with support from the Robert Rauschenberg Foundation & The Kendeda Fund, and the Pritzker Foundation. Awavena is a US-Australian production. Here are a selection of stills and behind the scenes photography from the Australian films selected for the 75th Venice Film Festival.